At the tender age of two and a half the majority of Tin Box Tot’s dinosaur knowledge comes from George off Peppa Pig. Yes, dinosaurs go ‘grrrr’. I was keen to broaden her horizons a bit so last weekend I took her off to SeaCity Museum in Southampton. Mr Tin Box was busy preparing our top notch (cough) clobber for a car boot sale the next day so rather than waste our afternoon in front of the telly box I decided we’d go out. Thanks to a handy e-newsletter that I get from Southampton City Council I had heard about the Dinosaur Encounter at SeaCity Museum. It is part of the Hampshire wide DinoFest 2015 event, which has brought exhibits from London’s Natural History Museum to the south this summer. 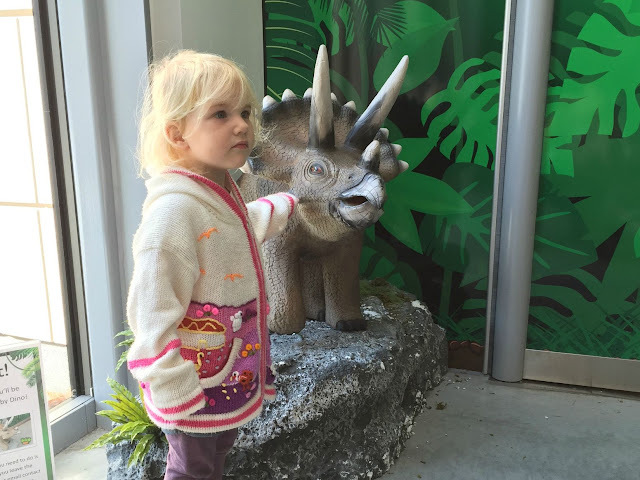 There was a little niggle in the back of my mind about taking a toddler to a dinosaur exhibition. They do look uncannily like monsters and I really didn’t want to give TBT nightmares as we’ve been getting quite good sleeps recently. So all the way there in the car we were talking about dinosaurs and that they weren’t real and it would be fun. Sorted! We paid for our entry to the special exhibition in SeaCity’s Pavilion hall, walked passed the gift shop and cafe, and to the entrance. Things were looking good when I managed to get a snap of TBT with one of the cute baby dinosaurs outside. 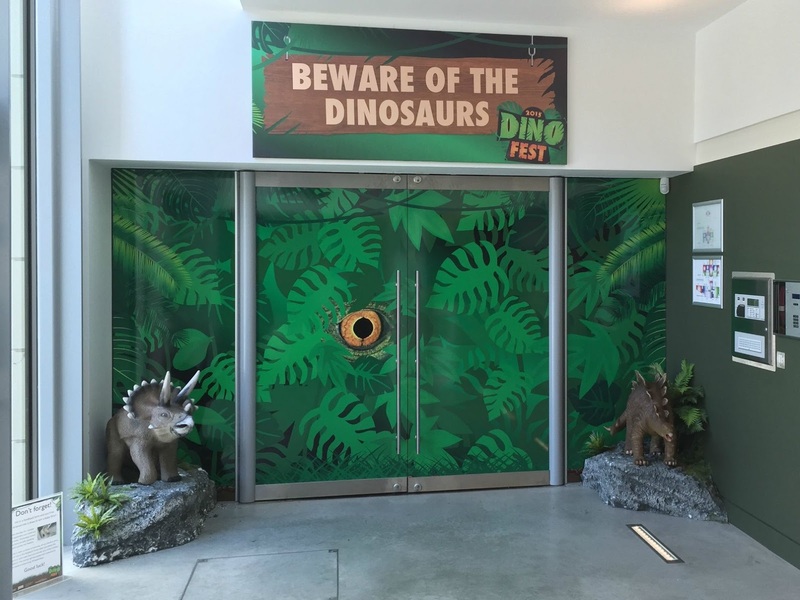 Then I opened the door…and a rumble of pre-historic roars greeted us. TBT was rooted to the spot. After a little bit of coaxing it was clear that she wasn’t going in so we headed back to the cafe for a drink. One Fruit Shoot later and after a bit more discussion about the dinosaurs not being real we gave it another go. This time we had success. Slowly but surely TBT edged inside. The first things you see are a giant dinosaur skull and a huge skeleton. When you’re less than a meter tall these must look awesome. 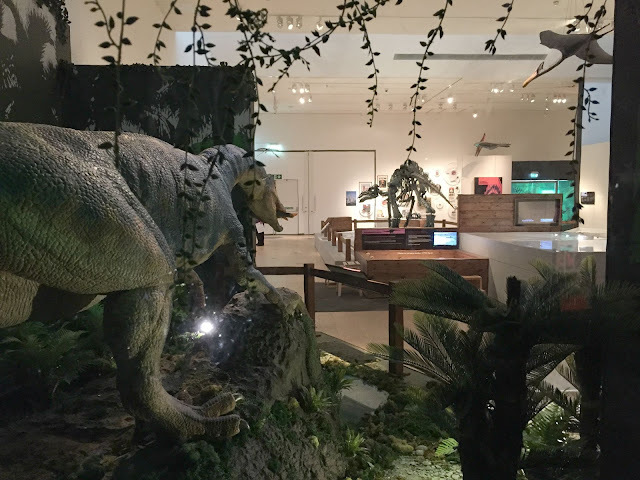 Across the room is the first animatronic beast – a Baryonyx, which would have lived on the flood plains of England, France and Belgium. TBT was very excited to see it eating a fish as she’d had fishcakes the day before. She was still a little reluctant to go any further until we’d talked a bit more about the dinosaurs not eating her toes. The exhibition is split into two sections. 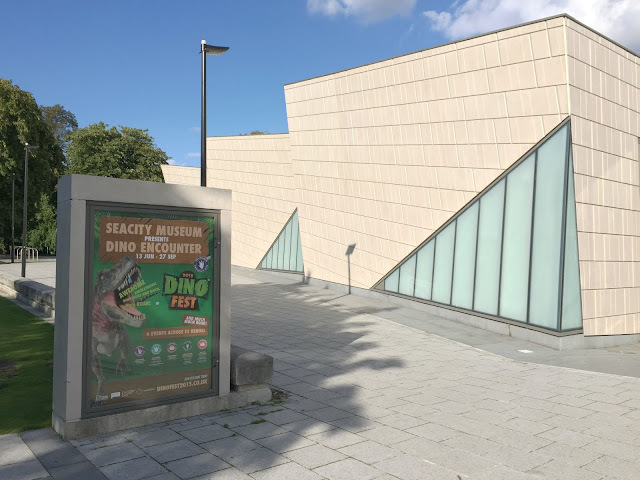 At the front are fossils discovered in the area and details of research undertaken by palaeontologists from the University of Southampton. 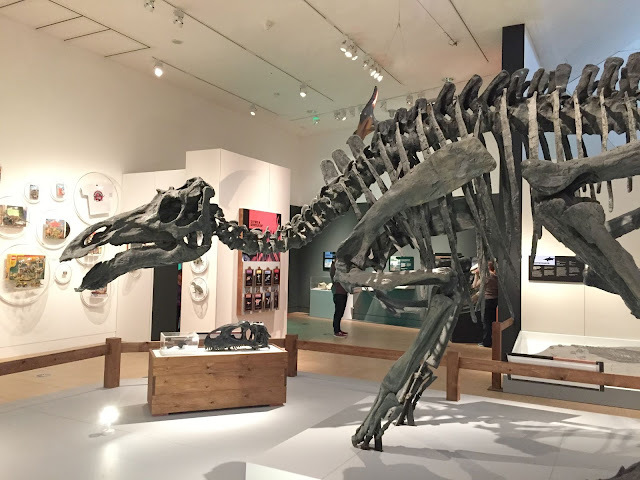 Dinosaur hunter wannabes can read how real life researchers got their jobs, as well as conduct their own dig and find out how modern technology is helping us understand these ancient reptiles better than ever before. 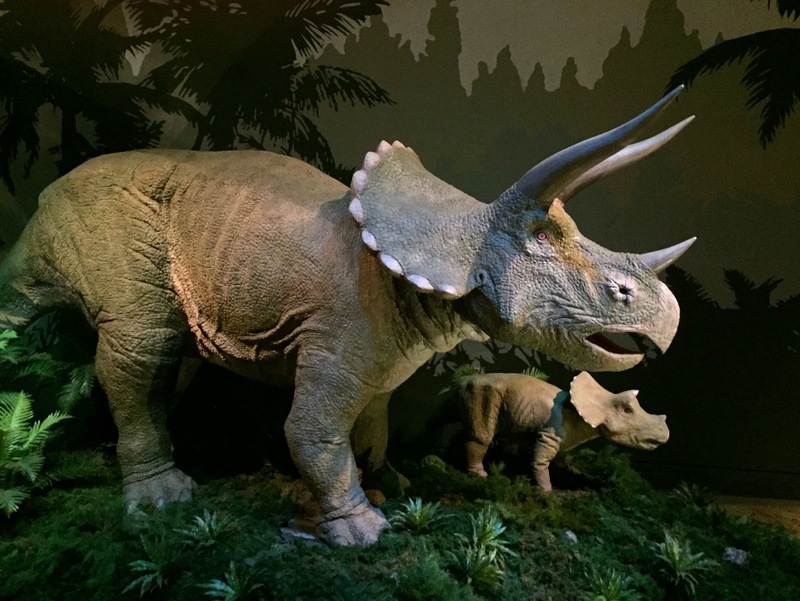 I was interested to learn that so many technological advances have been made in the past 20 years that more dinosaurs have been named in that time than in the previous 100. History lessons will have changed a bit since I was in school! The star of the second part of the exhibition is the snarling Tyrannosaurus Rex. TBT could see it from a far and cautiously followed me through the gap that linked the exhibition spaces. 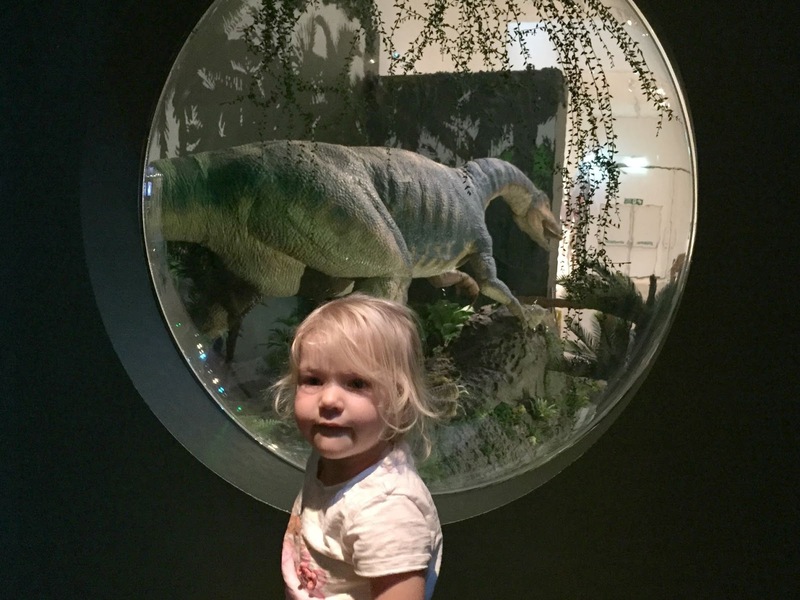 We were so focused on the T Rex that we didn’t see the Tricertops and her two babies to our left until we were in the room. Again TBT needed a bit of reassurance so we sat down in a cubby hole with a window that looked back into the Baryonyx display. From here she could see all the ‘robot’ dinosaurs and her confidence grew that they really weren’t interested in her toes. 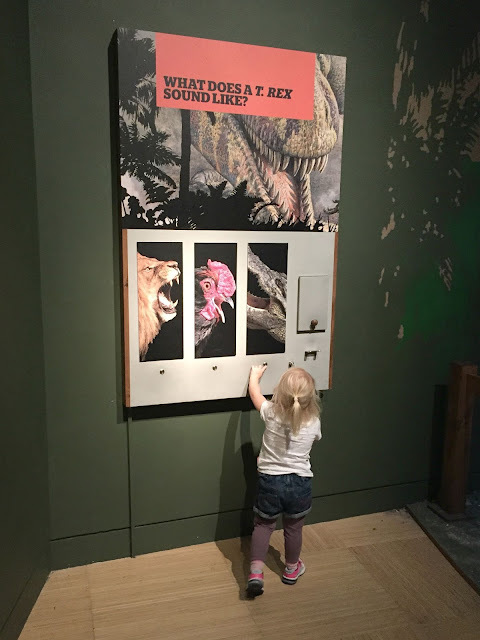 Alongside the moving beasts are interactive displays telling you more about the sounds the dinosaurs are thought to have made and what their skin felt like. 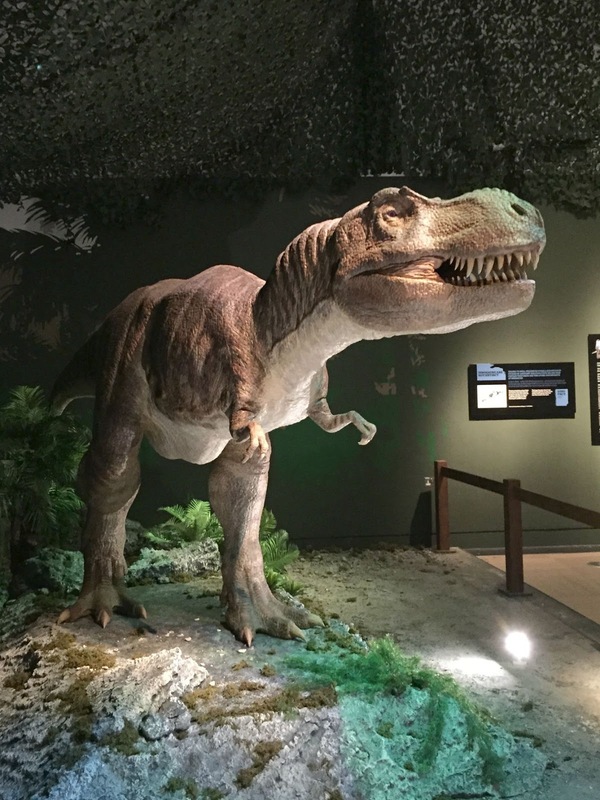 Did you know the T Rex would have had feathers? I don’t remember that from Jurassic Park! We spent an hour looking around but I think families with older kids could spend longer. There was so much more that we didn’t get to look at properly. 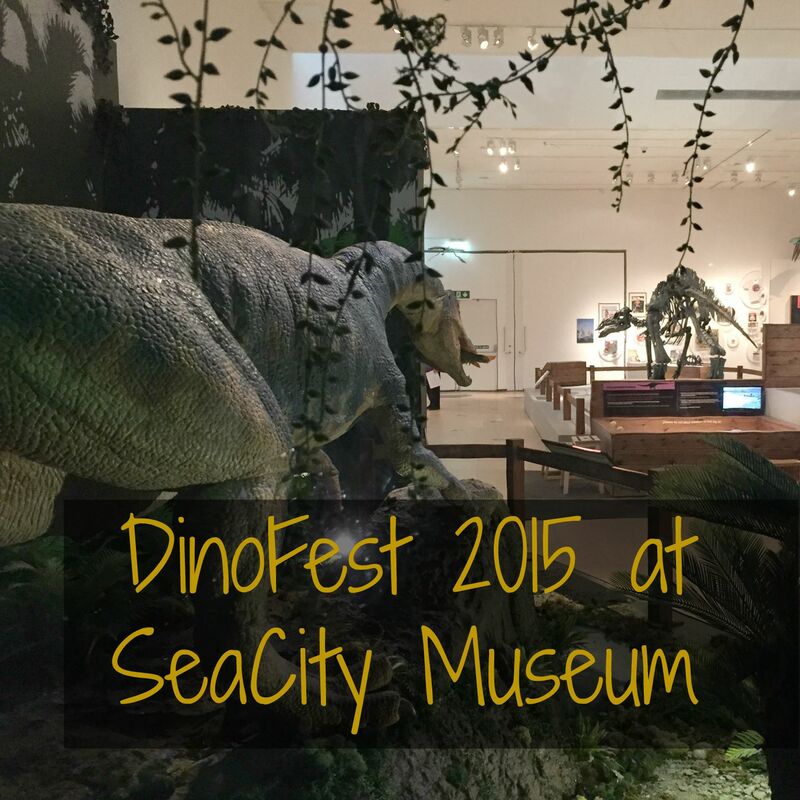 Unfortunately this special exhibition closed on 27 September 2015 but other DinoFest 2015 events are happening until the end of the year. Disclaimer: we paid for our own entry to the Dinosaur Encounter and all views are my own. It looks like a really fun place to visit…. 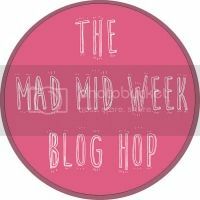 That looks really interesting, my boys would love it! No problem. It was good fun!